Subject: Spanish (Total immersion) Price: Complete Level 1 Kit, $135 (over 6 hours) Ages: 3 to adult Heflin and Thrall Language Publications www.spanish-for-kids.com 888-313-3310 By Michael Leppert Spanish is an excellent choice to learn as a second language to English. It is easy to understand and grasp in an elementary level enough to provide enjoyment and a feeling of accomplishment to the learner. It has a long history and rich literature (ex: Don Quixote), is closely-related to Vulgate Latin and Spanish is now the second-most-spoken language in the world, after No. 1, Chinese and ahead of No. 3, English. Virtually every state in the U.S. has its share of native Spanish speakers and this can provide you with great opportunities for real-life practice. 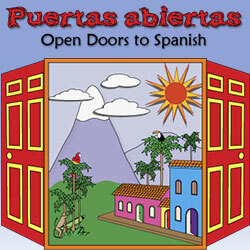 Puertas Abiertas (Open Doors) is one of the best Spanish-learning programs around. It consists of 5 entertaining DVDs and a 3-hour CD to accompany the Workbook Activities. The DVDs comprise over 6 hours of lessons, acted out by Dr. Jenifer Heflin and a cast of two little boys and a man, “Pepe”, who act out the Spanish words, actions and sounds, including little songs that review the vocabulary. The first 7 lessons cover the names of animals and the Spanish “A” (pronounced “ahh”). Dr. Heflin pronounces the Spanish words (no English is used at all) and images of the animals are shown behind her. The little boys enter the picture and repeat after Dr. Heflin and act out the actions of the animals. This feature removes the need for parents to know proper pronunciation and also requires the user to rely on Spanish-only – the most effective way to learn! The DVDs are produced in such a way as to provide body language and other subconscious aspects to connecting the Spanish word with the animal or other image. This makes the learning more effective and the user is encouraged to watch the Lesson as much as necessary to become comfortable with the vocabulary and pronunciation. The Kit includes a 105-page Facilitator’s Guide and a 212-page Student Workbook, in addition to the 5 DVDs. The Guide includes a dictionary of words and instructions to the teacher/parent about how to proceed through the lessons. One of the suggestions is for the parent to do the Workbook exercises before the student attempts them. This provides the parent with the opportunity to learn Spanish as well – one of the great advantages to being a homeschooling parent – learning many subjects along with your child! The approach used in Puertas Abiertas, is for the student to learn Spanish as a second language, in the same way we all learn our first language. We don’t know what all of the words are, but as we hear them spoken over and over, and we identify the words with their objects, we learn to speak. The DVDs are entertaining and watching them over and over will be enjoyable and very effective. To me, Spanish is a wonderful language to learn and Puertas Abiertas is an excellent program to use to accomplish Spanish learning. If one factors the price for Level 1 over a two-year period (or more), the Kit becomes affordable very quickly; especially when compared to other equally-comprehensive formats, such as live lessons.